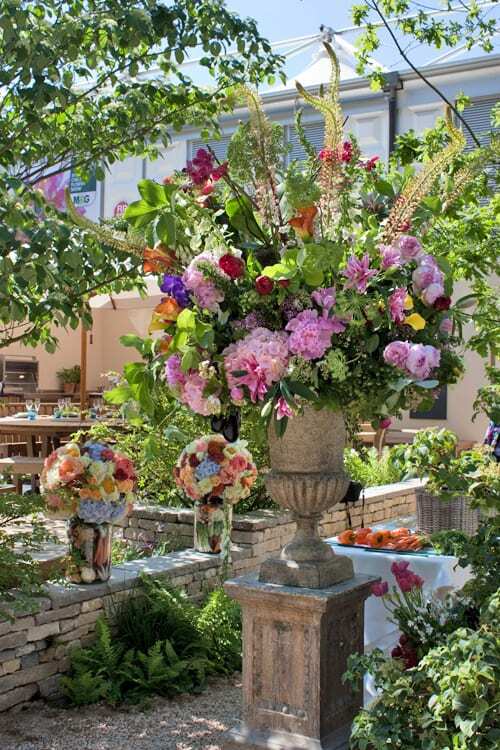 What an amazing day it was at the RHS Chelsea Flower Show yesterday! I was up at 5.15am and eventually got home at 7.15pm after a detour to a Chelsea Fringe event (more about that later!) I feel very privileged visiting the show on Press Day and we were blessed with stunning weather. If you would like to see some photos from my day, simply pop over to my Instagram feed. 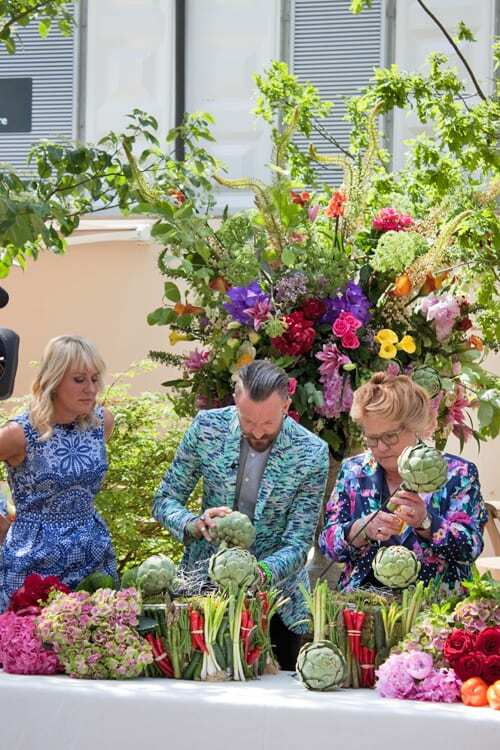 This week, all my blog posts will be Chelsea related – the show, Chelsea in Bloom and Chelsea Fringe. 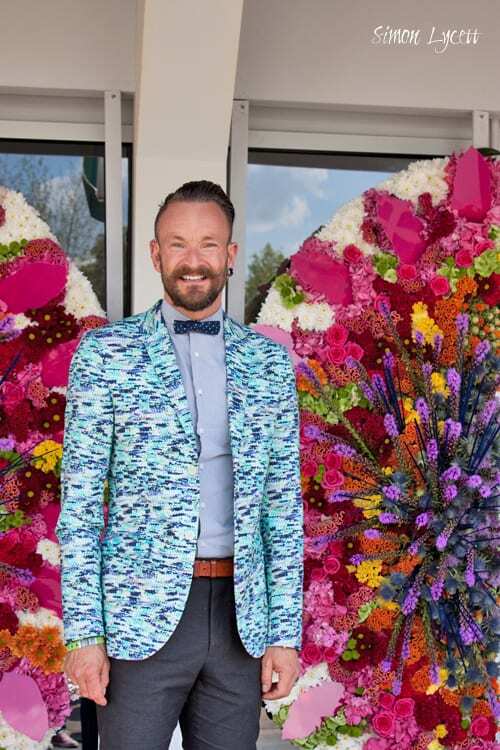 And I’m starting off with the fabulous florist, Simon Lycett at the show. 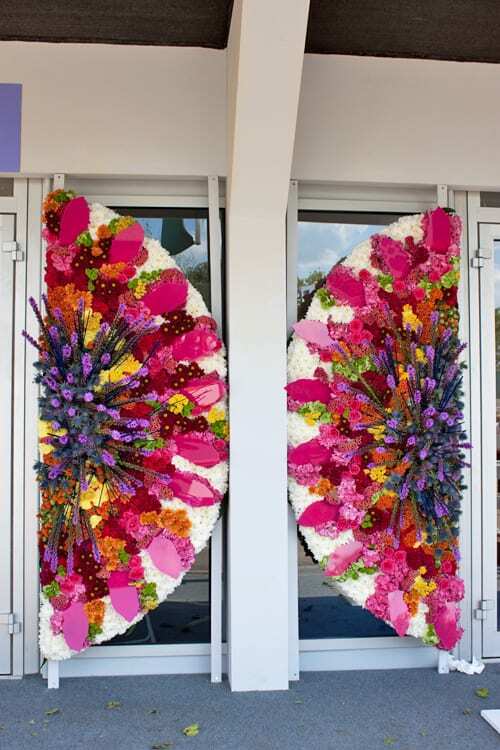 Simon and his team created a design for the entrance to the Floral Design Marquee. 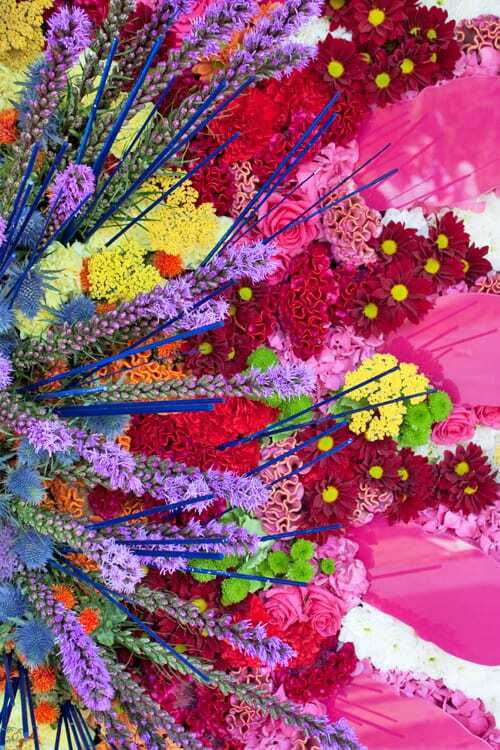 It’s based on the logo for this year’s show and includes celosia, liatris, chrysanthemums, eryngiums, roses, achillea, hydrangeas and carthamus. 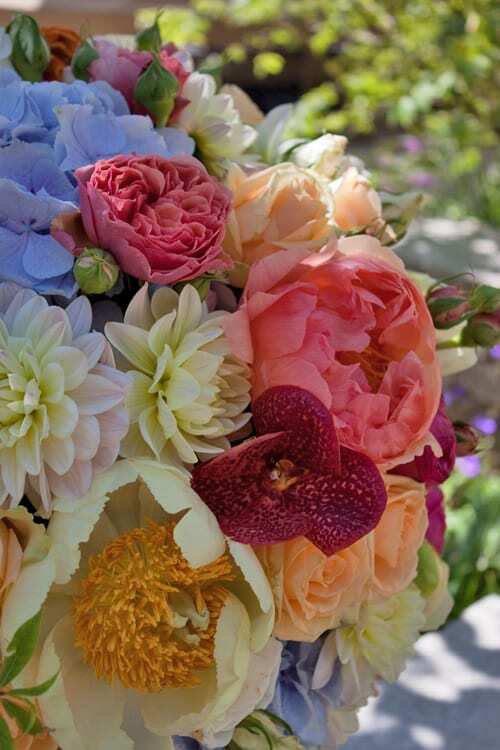 A riot of colour and texture! 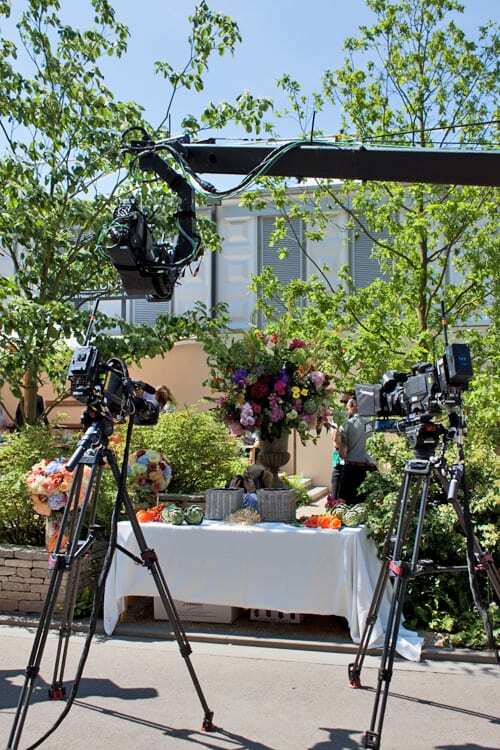 Whilst I was at the show, I watched as Simon recorded a floristry segment for a BBC TV programme later that day. 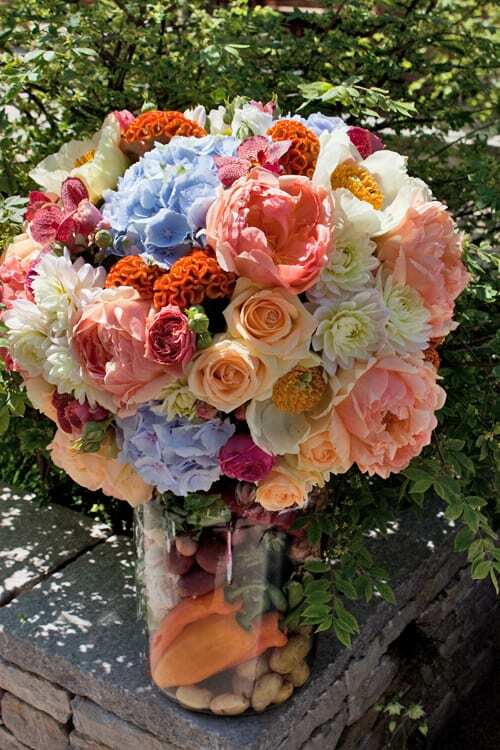 Below are two stunning arrangements and an urn, which formed a backdrop to the filming. And here’s a shot showing the cameras set up. 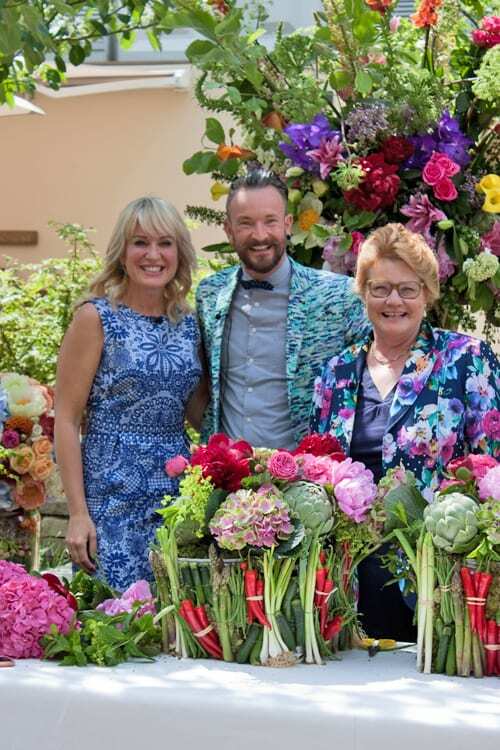 Simon was joined by presenter Nicki Chapman and vegetable grower Margaret Robinson. 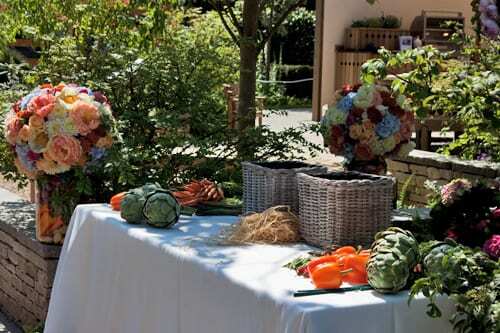 He showed Margaret how to attach small bunches of assorted vegetables to the outside of the basket, to add interest. 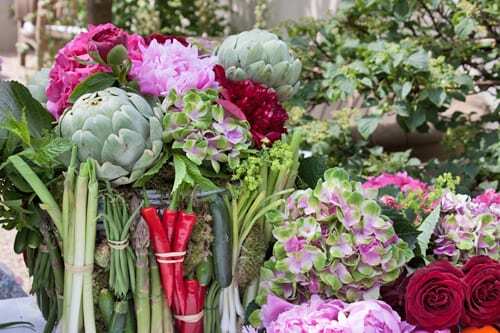 And they added artichokes, roses, peonies, alchemilla mollis and hydrangeas. Here are Simon, Nicki and Margaret with the finished arrangements. Aren’t they wonderful? Do look out for another floristry demonstration by Simon for the BBC on Friday. Lovely to see such beautiful use of the Avalanche+ series from Lex+, Merlot, Country and Grand Orange from Fides! Lovely pics, Rona. We must try and get tickets next year, can’t believe I’ve never been! Will look forward to more posts about the show.